By Makarand A. Gadre, email: makarand@gadre.org. Version 2.0.7 released on 2012/May/08: Added keystroke (Shift-W) for Unicode U+0972 (ॲ). Version 2.0.4 released on 2011/September/04: Added keystroke (AltGr-4) for Rupee Symbol. See note about Rupee Symbol. Version 2.0.1 released on 2010/August/24. Click on DOWNLOAD NOW, and save the zip file to your hard disk. Please read the information on Unicode here to understand how different languages, scripts and fonts work. This keyboard layout works with any computer running Windows versions later than Windows XP and having a standard 102 Key keyboard. Once installed, this becomes a system wide Devanagari Keyboard layout and is available to all the Unicode aware applications like MS Office Family applications, Notepad, most browsers, and applications / systems running under browsers like Hotmail, Gmail, Facebook and so on. Note: If you are typing in browsers, you need to type slowly because the browsers seem to process your keystrokes rather slowly. If you have already installed an earlier version, you must first uninstall it. Note: This is step is required only for Windows-XP and Windows 2003 Server. If you have Windows Vista, Windows 7, Windows 8, your Operating System is already configured to handle complex scripts. Just go to Step 2. · If “Install Files for Complex Scripts….” is “On” i.e. checked, go to Step 2, otherwise check it “On” and press OK. Windows will ask for the Windows XP CD and most probably will ask you to reboot. After reboot, go to Step 2. · Unzip the Keyboard Driver zip file that you downloaded earlier to somewhere on your hard disk. · Locate the folder where your unzipped and run (double click) SETUP.EXE. · Go to Control Panel / Regional and Language Options. · Click on the Details button under the “Text Services and Input Languages” group. · Click on Add and Add Your Input language, Check on the Keyboard layout / IME checkbox and select “Marathi Phonetic by Makarand Gadre v 2.0.4”. On Windows Vista or Windows 7, this will be already done so you need to just verify. To use the keyboard, use LeftAlt-Shift to cycle through the installed keyboards. You can also use the language button on the windows Task Bar. If you want to use the keyboard for another language which uses Devanagari (e.g. Sanskrit, Hindi, Konkani, Nepali), Click on “Add…” choose your language, click on the keyboard then click on “Show More…” and locate and choose “Marathi Phonetic by Makarand Gadre …”, and Press OK. This is a phonetic keyboard layout for typing Devanagari text. To goal is to be able to type transliterated Devanagari text using the standard US English keyboard layout. Effort has been made to have this layout reasonably phonetic. Clicking on “Marathi (India)” will select Marathi as the current input language. LeftAlt-Shift can be used to switch between English and Marathi. Keys Table lists the keystroke(s) and the character(s) it will produce. This column lists the character values as specified by Unicode Consortium. The Devanagari character chart in PDF format is available at http://www.unicode.org/charts/PDF/U0900.pdf (approx. 84KB). The visual shape of the character in Mangal font, which comes with Windows. The description of the character. The key sequence to be typed to produce the Devanagari Characters. Do not type the angular brackets or the + sign. AltGr is the Right Alt key. AltGr+I means hold down the AltGr key and type I and release the AltGr, similarly for Shift, however you can use either of left or right Shift keys. Some Devanagari characters will require more than one key presses. These are Composite Keystrokes. Typing the second keystroke <H> will yield character थ (U+0925), Typing a second keystroke space or anything else other than <H> will yield त (U+0924). If the first keystroke of a Composite Keystroke is followed by second keystroke which does not constitute a valid composite sequence, the composite character will be completed as if a space was pressed and the second keystroke will be processed. Note about Microsoft Word: Microsoft Word will tag the language as Marathi if you use this keyboard. 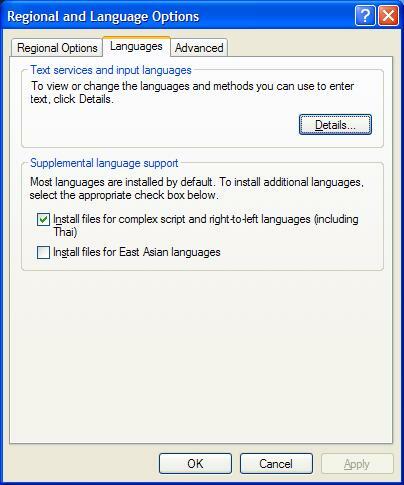 To change the language, select the text and choose the proper language from the Tools/Language/Set Language Menu. A joined characters is composed of two or more consonants separated by a halant (हलंत i.e. “अक्षराचा पाय मोडणे” in Marathi). ZWNJ and ZWJ are invisible characters that force a join or a non-join on connected characters. The following joined characters are used commonly so I have assigned them to keys. At this point, many fonts still do not have the shape (picture) for the rupee symbol. So you will see a rectangle instead of the ₹ (RUPEE_SYMBOL). As of today, the font “Segoe UI” which comes with Windows 7 has the symbol ₹ and other fonts also may have it. If you see a rectangle instead of ₹, it means that the font does not have the shape (picture) for the Rupee symbol. Windows 7 and Microsoft Office 2010 products (Word 2010, Outlook 2010 etc.) do an automatic smart font substitution to show ₹ even if you are typing in some other font. This also works in browsers like Internet Explorer, Firefox and Chrome. This does not seem to work in notepad, yet. · What is the difference between “Makarand Gadre’s keyboard layout” and Baraha or Google Transliterator? ü Baraha : Baraha is an IME (Input Method Editor) See Wikipedia Article on http://en.wikipedia.org/wiki/Input_method_editor to have detailed information on IMEs. In non-technical terms, IMEs are programs that intercept the keystrokes typed on the keyboard and send different characters. ü Google Marathi Typing works in the browsers. The Marathi transliterator runs a program inside the context of the browser’s editing window and converts the characters as they are typed. Such programs that run inside the browser’s context are referred to as Scripts. ü “Makarand Gadre’s keyboard layout” is not a program. It is an operating system level keyboard mapping so there is no program running in the background. There is no extra processor power and no network bandwidth used. Every physical key on the keyboard has a key number associated with it and there is a table which has the key number and the corresponding Unicode character to be sent to the program. “Makarand Gadre’s keyboard layout” is just a new table that maps the key numbers to devanagari characters. · OK I Installed it. What do I do next? ü Once you have successfully installed it, go to the program of your choice (say Microsoft Word). Once you get the caret blinking in the Editing Window, press LeftAlt and Shift keys together and release them. This action will switch the keyboard layout. Now start typing and the characters will show up in Marathi. Press LeftAlt-Shift again and you will go back to English typing. LeftAlt-Shift switches between the installed keyboard layouts. · Can I use this on Blackberry? Or Mac? ü At this point these are not supported. If you want to know why, send mail to me. · I am used to Google Transliterator or Baraha. Why should I use yours? ü The goal is to be able to type in Marathi (devanagari) so there is no need to switch if you already have a Marathi typing solution.